At the beginning of each school year, hundreds of thousands of college students descend upon cities and towns all around the country. They and their shell-shocked parents carry and drag carton upon carton of “stuff” with which to make their dorm rooms feel like home. And very often, at the end of each school year, these same students make their mass exodus, leaving behind the sad remnants of what just months before were considered to be “college essentials.” These are things that were never really needed in the first place, and have now been relegated to the “free for the taking” piles scattered all over campuses and in front of dorms. It is for that reason, when it comes to a dorm room list, our philosophy is “less is more.” As much as you want to create an environment for your child that will make them feel comforted and nurtured, remember that you can always fill in later. But, it’s much more prudent (and less expensive) to streamline the list from the get-go. Here’s What’s Really Important To Bring For College Move-In Day…..
Bedding: Most dorm beds are Twin XL. Just the basics here. Fancy throw pillows are nice, but they’re called “throw” pillows for a reason. Pass on those. Fluffy, the stuffed dog your child has had since preschool will always be welcome. Bath Supplies: Towels, soap,shampoo, conditioner, shower cap. A shower caddy to transport it all to and from, and a pair of flip flops (showers get scummy). Techie Stuff: Laptop/computer, phone charger, power strip, task/desk lamp, headphones (roomies can get noisy). Clothing: Be very discriminating when it comes to this category. Storage in dorm rooms is at a bare minimum. If your child will be in a cold climate, buy a heavy jacket. Sweaters and sweatshirts can double for that if they’re not going to the Tundra. Clothing from home can always be switched out during visits home. And don’t forget the detergent and laundry bag (yes, you can use a pillow case). Miscellaneous: First-aid kit, snacks, photos of the family (and the pets). Now, that was easy peasy, wasn’t it? To make it even EASIER, consider OCM’s Complete Campus Pack. It’s like a one-stop shop for all the major things on your list. The quality of the sheets and the towels has been upgraded, and they’ve even added a microplush blanket for those times when a student really feels the need for some cocooning. By purchasing this all-in-one pack, you’re saving $100. Would you like to win a FREE OCM CAMPUS PACK for your own student? 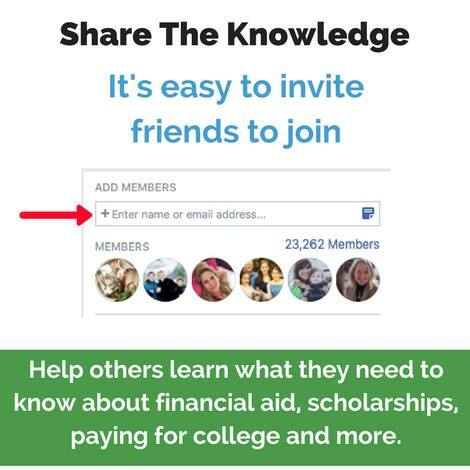 Just invite one person who you think could benefit from being a member to the Paying For College 101 Facebook group. Leave their email address in the line under “Add Members”, which is in the upper right corner of the group sidebar. We’re can keep track of members who invite others, so when you invite a friend your name will be entered into our contest. The giveaway expires Thursday, July 20th 2018. One winner will be selected randomly and announced on Friday, July 21, 2018. US only. Good luck! This post was sponsored by OCM. OCM has been helping millions of families outfit dorm rooms with high-quality products (care packages, graduation gifts, and more) for almost 40 years. Endorsed and sponsored by more than 900 college campuses and 1,500 campus organizations, they also give back a portion of each purchase to your student’s school. In fact, they have sent back $23M from purchases to schools for campus programing, as well as, donating to over a dozen local charities and non-profit organizations such as United Way, American Red Cross, Women in Need shelters, Humane Society, even victims of Hurricane Irma in Puerto Rico. Students and parents can visit the new website at ocm.com to shop over 10,000 college-approved products.